Formerly a laborious task, the process of DNA design has grown increasingly easier for molecular biologists. Now, with online design software, it requires considerably less time to complete the design and synthesis. Genome Compiler is further simplifying the process by embedding useful tools like the RBS Calculator in its free designer software. The RBS Calculator is a valuable tool for anyone working on designing genetic systems. Developed by Howard Salis and the Salis lab, the RBS Calculator simplifies many of the tedious processes involved in achieving optimal protein expression and pathway productivity in these systems. The RBS Calculator is a biophysical model that predicts translation initiation rate (TIR) for each start codon in an mRNA sequence. The calculator uses this information to design ribosome binding sites to control the TIR for optimal protein production. Controlling TIR is crucial because while transcription and translation rates can be regulated, protein folding rate cannot. Thus, to ensure that soluble and active protein is produced in a cell it is imperative that the TIR is not faster than the protein folding rate. The RBS sequences designed with the calculator are engineered to rationally control protein production rates to maximize the system’s overall performance. Another feature of the RBS Calculator is codon optimization. When too many ribosomes bind to a strand of mRNA, it causes a “traffic jam” in translation elongation, which then causes the cell to grow very slowly. 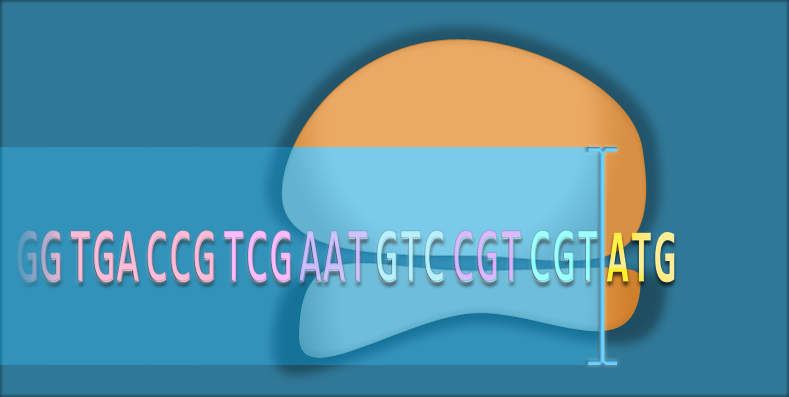 Codon optimization prevents this oversaturation, ensuring that translation elongation will not be the rate limiting step in protein synthesis. 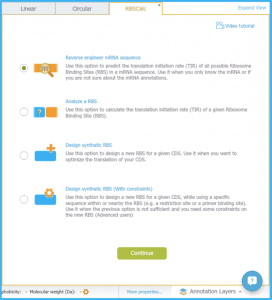 The RBS calculator utilizes the statistical thermodynamic model to determine how well a specific ribosome will bind to the mRNA. According to statistical thermodynamics, the binding free energy of a ribosome to a specific mRNA will determine the probability that the ribosome will bind to it, which will be proportional to the mRNA’s translation initiation rate. The RBS Calculator calculates a ribosome’s free binding energy to construct RBS sequences for optimal TIR. The model also takes into account several other factors that affect translation initiation rate. This gives it a clear advantage over by-eye or manual RBS design, in which these other factors easily go unnoticed and can alter the result. The RBS Calculator is also more accurate and significantly faster than these other methods. to analyze, it will predict all the coding sequences and their respective translation initiation rates and Ribosome Binding Site sequences. This will help you to predict the most translated coding sequence. Analyze RBS mode - when you know the Ribosome Binding Site and its corresponding coding sequence, and you need to predict the translation rate of the coding sequence and decide if you need to optimize it. Design Synthetic RBS mode (forward engineering mode) - when you need to optimize the translation rate for your coding sequence. This mode will generate a synthetic binding site according to your targeted translation rate. Design Synthetic RBS with constraints mode - when you need to add constraints to your design RBS sequences (for example, to include a restriction site). In addition to the basic calculator, the Salis lab also developed the RBS Library Calculator. The RBS Library Calculator provides users a simplified way to find the optimal enzyme expression levels for maximal pathway productivity in a genetic system. It catalogues the relationship between RBS sequence, enzyme expression level, and pathway productivity so users can turn to this tool rather than wasting time conducting lengthy experiments to characterize pathway variants. Additionally, the information can be applied to similar systems in future experiments, so researchers will not need to start from scratch. The RBS Calculator is an excellent time saver for building genetic systems. Especially now that the tool is incorporated in Genome Compiler’s software, the entire DNA synthesis experience is simplified. Check out these blogs for more information on the RBS Calculator, the RBS Library Calculator, and a Q&A with Professor Salis, or learn how to use it inside Genome Compiler.